As our nation has said its fond farewells to Senator John McCain (1936-2018), Americans including myself, have pondered the question, "How do you describe John McCain?" Senator McCain had a well-earned reputation as a "Maverick", which means he did things his way, which sooner or later surprised, pleased, irritated, or chagrined everyone — and quite often the same people experienced all of those reactions at differing times — I know I did. However, one thing you could always take to the bank — John McCain was going to do what he thought was best for America. The son and grandson of four-star admirals in the U.S. Navy, he graduated from Annapolis, became a carrier fighter pilot and was shot down over Hanoi, badly injured and captured. Kept in solitary confinement, tortured terribly, for over five years in the "Hanoi Hilton," he turned down early release by his captors because they refused to allow him to take all of his fellow P.O.W. 's with him. Senator McCain bore the scars of that torture for the rest of his life. For example, because of the torture damage done to his shoulders, he could never comb his own hair again for the rest of his life. Returning to America in 1973, he became a congressman from Arizona, a six-term senator for that state, and was the Republican party's nominee for president in 2008. Senator McCain devoted his entire adult life to serving his country. Despite his terrible experiences in Hanoi, Senator McCain insisted that, "he was the luckiest man alive" to have lived the life he lived and to be born an American. What better definition of an American "exceptionalism" can there be than the one John McCain gave us in his own words and in the life he lived. On a more personal note, I had the privilege of knowing John McCain fairly well. We worked together on some issues, while being opposed on some others. During the Iraq war, in the first decade of this century, there was a tremendous controversy over enhanced interrogation and water-boarding. Both Senator McCain and I strongly opposed water-boarding, much to the chagrin and frustration of large numbers of our supporters. I wrote Senator McCain a letter telling him how much I agreed with him and admired his stance and told him that as far as I was concerned, no American had earned more right to speak to the issue of torture as a moral issue that John McCain, veteran of the Hanoi Hilton. Imagine my surprise when I received a personal phone call from the senator in which he told me that he cherished the letter, and said, "Reverend Land, I have your letter here on my desk in my senate office and I am going to keep it here to remind me to do the right thing." Wow! For me it was one of the few times in my life that I was momentarily speechless. I had the privilege of leading the memorial service for the late Senator Fred Thompson in 2015. Senator McCain who was in attendance at the service for his good friend and colleague, specifically mentioned that letter to me when we visited briefly after the service. As it became clear that the senator's brain cancer diagnosis was terminal, he made two statements that personified the man. When asked what the nation's reaction might be to his death, he responded, "I hope those who mourn my passing, and even those who don't, will celebrate ... a happy life lived in imperfect service to a country made of ideals." When asked how his fellow Americans might remember him, he replied," So I think if there is something on my tombstone, it'll be, 'He served his country.' And, hopefully, you add one word -- honorably.'" Honorably, indeed. 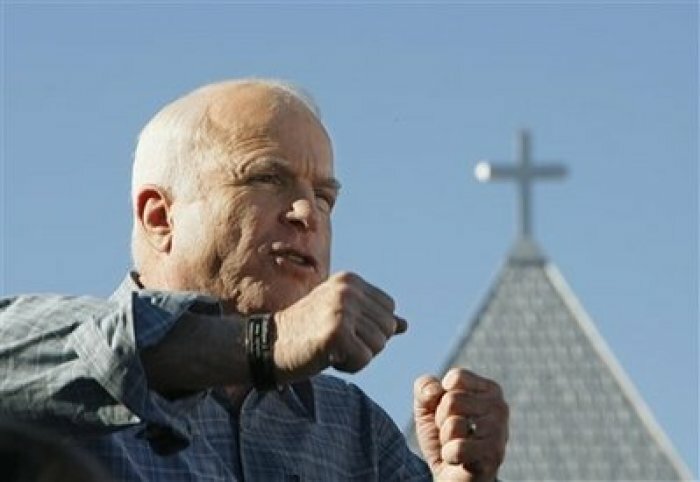 I can think of no better personification in my lifetime of "Duty, Honor, Country" than Senator John McCain, American.